When the West Central Area School District needed a ramp to help with stage accessibility for school performances, the Elbow Lake Area Community Fund teamed with the district and the Elbow Lake Fire Department to meet the need. 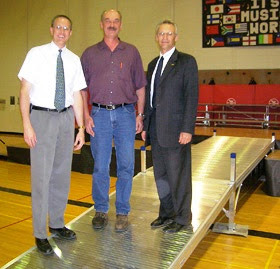 Showing off the new ramp are: Pat Westby, WCA Elementary Principal, Al Schoenbauer representing the Elbow Lake Community Fund, and Gary Huebner, Elbow Lake Fire Department. The Elbow Lake Area Community Fund is a component fund of West Central Initiative.